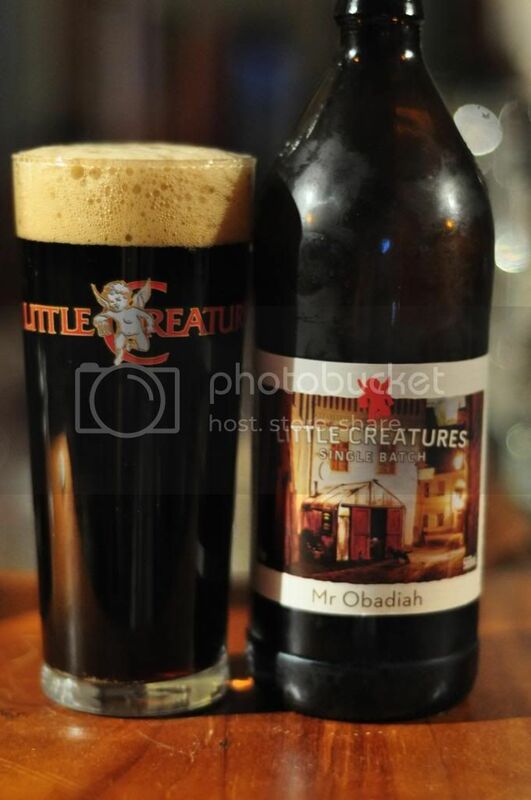 Mr. Obadiah is the latest Single Batch release from Little Creatures. It's an English style Porter brewed with Rye. I haven't had many but I've never had a Rye Porter that I haven't loved so I'm really looking for to seeing what Little Creatures have come up with. I can hardly believe that this is the first time I've reviewed a Little Creatures Single Batch beer! From the Dreadnought to Puffing Billy right through to Shepherd's Delight, they've produced so much quality recently. Anyway, the long and short of this is if you find a Little Creatures Single Batch; but it! Now it's time to (hopefully) add another ripper of a beer to this list. Let's try Mr. Obadiah. The pour is absolutely sensational! Beautiful dark brown, almost black, colour with a big khaki head on top. The head does have some large air bubbles shortly after pouring but this doesn't stop a relatively thick layer of foam staying for the entirety of drinking. It's a very traditional looking porter, if it tastes half as good as it looks it will be a sensational beer! When I tried this last night, my nose was a bit blocked. I was anticipating not being able to smell alot, considering it's an English Porter, however I was pleasantly surprised. There was a great mix of coffee and roast aroma's, while I could also get hints of rye. I didn't smell any hops, but that's not to say they weren't there, they may just have been subtle. Mr. Obadiah is close to the perfect Porter for me. The rye element isn't overly strong with only a small hint of spiciness. Coffee and roast flavours are both present and in perfect balance. There's also a nutty element which I hadn't noticed on the nose, which is very nice and adds a layer of complexity. To accompany the dry finish there is just a tiny hint at hop bitterness. Little Creatures Mr. Obadiah may have just taken the title for my favourite Little Creatures Single Batch release! That's how good this beer is! It's just a fantastic example of a balanced porter. This one was released back in June, before I went away, so stocks will be limited now. If you find some buy it, if you're a dark beer lover you won't be disappointed.